We stayed at the Aries Hotel for the first few days in Saigon, but then moved to Lucy Hotel on Le Lai Street. The room here was much bigger and the location was great. We stayed here for about a week. Price was pretty reasonable. As you can see from the image above, this room is pretty big. The room had a huge bed, very large desk and chair, TV, seating for four around a round table, wardrobe, chest of drawers, another table, fridge and kettle. This hotel also has a cafe downstairs, and free wifi. When I tested the speed, it was around 2.0 Mbps. The one thing that might let this room down is the noise, as it’s on the main road and near a park that has aerobics that start at 5 am. There are smaller rooms at the back of the hotel though, and they should be quite quiet. The front rooms also have balconies that look out over the park opposite. If you’re feeling energetic you can enjoy an aerobic session in the park. The above video shows one of the evening aerobic sessions. We were quite happy with this hotel, mainly because the room was so large and so beautifully finished. 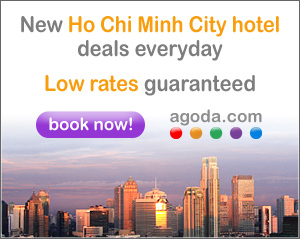 To book a hotel in Ho Chi Minh City, click on the Agoda link below.